The international defense industry fair (IDEF 13) held in Istanbul, Turkey, from May 7 to 10 saw the Turkish industry announce a number of developments. The most notable was the revelation of three potential concepts for the TF-X national combat aircraft program, a stealthy aircraft that is ultimately expected to replace the F-16. Turkish Aerospace Industries (TAI) was awarded a contract last year to begin conceptual design of the TF-X, and earlier this year it was reported that the company had signed a technical assistance contract with Saab. The Swedish company has been working on advanced fighter concepts for some time through the FS2020 and generic future fighter (GFF) programs. 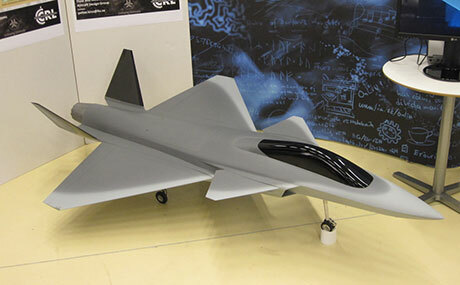 For GFF, the University of Linköping’s fluid and mechatronic systems division produced a 13-percent-scale, radio-controlled model of a stealthy fighter concept, which was first flown in November 2009. One of the three TF-X concepts revealed at IDEF 13, a single-engine, twin-tail canard delta, shows some similarity to the Saab design. The other two concepts–one single-engine and one with twin powerplants–have conventional tailplanes. TF-X is scheduled to fly in 2023, with initial operational capability planned before the end of the decade. It is due to serve alongside the Lockheed Martin F-35. For the single-engine aircraft, Turkey reportedly hoped to acquire the Pratt & Whitney F135 engine for commonality with the F-35, but the U.S. is apparently reluctant to agree. Instead, it is believed that the intended powerplant would be the General Electric F110-GE-132 that powers the Block 60 F-16. For the twin-engine concepts the intended powerplant could be Eurojet’s EJ230, an up-rated version of the EJ200 that powers the Eurofighter Typhoon. However, this advanced engine has not yet been developed. TF-X would feature internal weapons bays and advanced sensors developed within Turkey. Aselsan will reportedly develop an AESA radar for the aircraft, which may feature gallium nitride (GaN) technology. Turkey is apparently establishing a foundry capable of making GaN transmit/receive modules. Also at IDEF 13, TAI reported that the Hurkus turboprop trainer is due to make its first flight next month, and should get a first production order in the next few weeks. Egypt is expected to sign for the Anka UAV next month, too. Roketsan revealed a new weapon, the Smart Micro Munition, due for integration with the Anka later this year. Azerbaijan is also showing interest in the T-129 attack helicopter, a version of the AgustaWestland AW129. The Turkish air force said it will retire the bulk of its Northrop F-5 fleet, leaving a few aircraft flying with the Turkish Stars aerobatic display team. The F-5s were modernized for the lead-in fighter training (Lift) role, but they are running out of airframe hours. At least 55 T-38 Talons are being upgraded to take over the Lift tasking from the F-5. The Turkish navy has amended its order for ATR 72 maritime patrol aircraft to cover six ATR 72-600TMPA Meltem 3s with Thales’s Amascos mission system. Since April the first aircraft has been in TAI’s Akinci facility for conversion and is due for delivery in February 2017. Two utility-configured ATR 72-600s are scheduled to be delivered this summer.